DELISSA Kimmince has already reached the pinnacle in one sport, and now the Brisbane Lions defender plans on making it in a second. Kimmince captains Queensland's state cricket team and Big Bash League team Brisbane Heat, and has also donned Australia's green and gold in 11 one-day and eight Twenty20 internationals. Following last cricket season, though, the 27-year-old wanted a mental spell. But rather than just taking time off, she decided to join her friend – and now Lions teammate – Kate McCarthy and try her hand at Australian football. Kimmince went well, helping Yeronga to a Grand Final (but narrowly losing) and was then snapped up by the Lions as a rookie for the inaugural AFL Women's competition. Kimmince says although she's a latecomer to the sport, she doesn't feel she’s lagging. "Hand-eye coordination is a massive part of it and I've played cricket, I've played soccer, I've played touch footy, I've played tennis, so even though I'm new to (football), I don't feel I'm far behind," Kimmince told AFL.com.au. "It's just executing my skills really. Sometimes I still have no idea why the whistle blows, but I've never thought I'm behind. "It's just more the game-sense stuff, like how we want to play and move the ball." 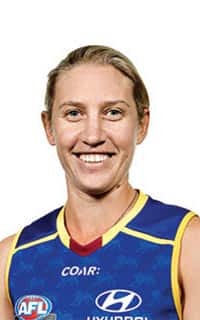 Growing up in Warwick, two hours west of Brisbane, Kimmince said she was never exposed to a Sherrin, so is working doubly hard on her skills in the lead-up to February's season start. Before then though, she has the WBBL starting on Sunday, and the all-rounder who bats in the top order and is a right-arm pace bowler, has been juggling training schedules between the Lions and Heat. "There's no point me going to cricket and footy and doing conditioning sessions at both. I'll be burnt out in two weeks," she said. "The coaches and support staff have been really good. There's contact between the cricket and footy clubs fairly regularly, which makes it easier for me. "(Lions coach) Craig (Starcevich) knows everything. The communication between both sports has made it easy." Kimmince will finish her cricket commitments one week before the Lions play their first pre-season game. Having seen women's cricket make the leap into Australian loungerooms through the WBBL in recent years, she said it was exciting being at the forefront of another sport hoping to do the same. "Last year we had more (big) crowds and the TV coverage was phenomenal," she said. "I think the AFL will follow. People will go and watch if it's on and they know about it. "The Australian public don't care if it's male or female. They just want to watch sport."